Ash Hashim is the founder of Futbolita, an international brand and website known as ‘The Female Football Voice’. She has conducted exclusive interviews with the world’s best players and covers the Beautiful Game for a variety of media. 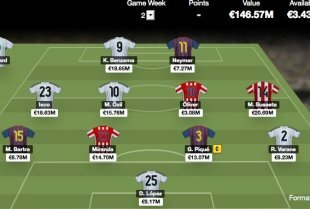 Futbolita’s pick of players for the Yahoo!’s Fantasy La Liga edition is a mix of experience and youth, although surprise surprise, there is no sign of Cristiano Ronaldo, Lionel Messi (they’re just way too expensive) or even Andres Iniesta. While this squad may be a little unconventional, many of the players featured at the recent U-20 and U-21 Championships for Spain, and like future football superstars, they have blitzed their way into the Spanish football radar. Plus, there’s no room for ego or bickering off the pitch, so we’ve included peace loving players who represent the Future of Futbol! Move aside Dani Alves and Casillas, this is Futbolita FC! There’s a reason Jose Mourinho picked second-choice keeper, Diego Lopez, over Iker Casillas last season — and that reason alone was believed to have cost him his job. Nevertheless, while Casillas has made goalkeeping history for the Real Madrid and Spain squad, Lopez is in fine form for Los Blancos. He made a total of 25 appearances for Madrid last season, and more notably, made a string of saves against Man United in the Champions League. So vamos, Diego, it’s your time to shine — and let Casillas focus on being a father! A target of Tottenham, Bartra has been hailed ‘the new Pique’, although he featured in just 16 games for Barca in 2012-13. He is tall, fast and strong in the air and possesses outstanding technical ability, especially in the challenging role of a centre-back, which was formerly dominated by Carles Puyol. Bartra also played a key role as Spain’s Under-21s side claimed the European Championships in Israel. Manchester City target, Miranda, may have been snubbed by the Brazilian national team, but his height and stature has provided cover for Atletico many times in the past. Manuel Pellegrini attempted to bring him to Malaga and he’s a big fan of the 28-year-old former Sao Paulo player. Viewed as Atletico’s answer to Real Madrid’s Pepe, Miranda is a no-nonsense type of player, who will link up well with Bartra. Gerard Pique may be distracted by his adorable baby son, Milan, at the moment but that hasn’t affected his performance on the pitch. A consistent presence at the back for Barca, Pique may not have had his best time under Tito Vilanova. Against AC Milan in the Champions League which Barça won 4-0, Pique made seven clearances, two interceptions and a tackle to lead the team to a clean sheet. He is a gamechanger, and this team needs one! Varane has been dubbed the most promising centre-back in recent times for Real Madrid, and this praise does not come easy for an institution with that much history. With Pepe’s injury last season, the dazzling 20-year-old took the bull by the horns and when played, he hardly put a foot wrong. His composure and class against Barca, Manchester United, Borussia Dortmund and Man City alone is enough to warrant a starting spot on our team. Vamos, nino! Mesut Ozil’s growth at Real Madrid has been steady and consistent, and he is showing signs of becoming more like his idol, Zinedine Zidane. Despite the presence of Cristiano Ronaldo, the German playmaker has evolved to become a complete midfielder who took more kicks and created plenty of assists for Benzema and Ronaldo. He will link up perfectly with Isco. A La Liga dream team is not complete without the Spanish U-21 starlet that is Isco. Although a traditional ‘Number 10’ who can also play as a winger, Real Madrid’s young star would benefit from a partnership with Ozil. And there’s a reason we didn’t pick Ronaldo in the team: Isco would have all the space in the world to grow and learn from his German counterpart instead of being potentially overshadowed by the Portuguese superstar. Still just 20, Oliver is one of the brightest new talents of Spanish football. He displayed dazzling skills in midfield for Atletico Madrid, quick on the break and was an integral part of the Spanish U-20 side that made the semi-finals of the World Cup in Istanbul recently. When asked how he felt about being compared to the Barcelona legend that is Xavi, Torres was over the moon! As a bonafide right winger, Susaeta would fit in perfectly in this squad. He scored 11 goals in 48 appearances for Bilbao last season, and is a lynch pin of the team. A product of the Basque youth team, Susaeta is a disciplined player who made Vicente del Bosque’s Spanish team for the first time last November. Neymar may have made his debut in the 68th minute in Barca’s 7-0 thrashing of Levante over the weekend, but this Brazilian star is definitely one to watch. With all eyes on him this season, the 21-year-old must score as many goals as he can before possibly leading Brazil to their most important World Cup campaign. While a supremely talented striker, Benzema’s greatest obstacle is his consistency, but I believe he will come good this season with Ronaldo, Isco and Ozil all providing him with plenty of assists and tap-ins. Benzema will need to take more initiative as a Number 9 in this squad if he wants to mature as a player.